One hundred percent asbestos-free, Centric Posi Quiet Semi-Metallic Brake Pads raise initial cold effectiveness and stabilize friction levels right out of the box. Utilizing the same positive molding process used by Original Equipment suppliers, Centric Posi Quiet Semi-Metallic Brake Pads offer consistent friction material density and performance characteristics while wearing evenly throughout the life of the brake pad. During the scorching phase, each brake pad surface is super-heated to simulate the initial break-in process performed by the installation technicians. This additional step removes any uncured bonding agents eliminating the need for initial break-in and reducing noise caused by pad glazing. Centric Posi Quiet Semi-Metallic Brake Pads feature precision cut or shaved backing plates that reduce vibration and noise while ensuring a proper fit in the caliper. 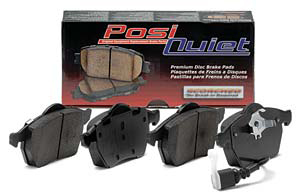 Compared to adhesive or drift-lock style shims, Posi Quiet brake pads are designed with mechanically attached, application-specific shims that provide superior noise reduction. Extensive brake dyno testing ensures Centric Posi Quiet Semi-Metallic Brake Pads meet Centric's exacting standards even before they're installed on a vehicle. Injen High Performance Air Filter (Black) - 3.5"